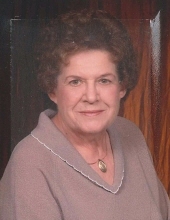 Patricia “Pat” Swartz, 87, of Waynesfield, OH passed away Sunday afternoon, November 18, 2018 at Auglaize Acres, Wapakoneta, OH. Pat was born September 13, 1931 on Van Buren, OH, a daughter of the late Emil and Vera Powell Copeland. On December 22, 1950, she married Clarence Swartz in New Hampshire, OH and he preceded her in death on December 8, 1995. She was also preceded in death by a son, Stephen Swartz. Pat is survived by her daughter, Cyndy Kohler of Waynesfield, daughter-in-law, Jo Ann Swartz of Lancaster, OH, three grandchildren, Alicia Kohler of Waynesfield, Matthew (Rachael) Swartz of Texas and Mark (Erin) Swartz of Newport, KY, two great grandsons, Layton Campbell and Keygan Morse, two brothers-in-law, Carl (Anise) Swartz of Cridersville and John (Jo) Swartz of Wapakoneta four nieces and two cousins. Pat was a 1949 graduate of Waynesfield School, and graduated from Northwestern School of Business. She worked at 1st National Bank in Lima, and The New Hampshire Grain Elevator from 1972 until its closing in 1989. Pat attended the former New Hampshire Methodist Church and Waynesfield United Methodist Church. She loved playing piano. Pat played at her first wedding at the age of 12 and continued through out her life playing for both churches she attended and many Waynesfield-Goshen School programs. She most recently played at her latest birthday in September. She was a good friend to many and will be greatly missed. A Special Thank You goes to the caring staff of Auglaize Acres. Pastor Vera Welker begins funeral services at 2:00 pm, Friday, November 23, 2018 at Waynesfield United Methodist Church with visitation from 12-2. Burial is in Walnut Hill Cemetery, New Hampshire, OH. Memorial contributions may be given in Mrs. Swartz’s name to New Hampshire Community Church or Waynesfield United Methodist Church. To send flowers or a remembrance gift to the family of Patricia "Pat" J. Swartz, please visit our Tribute Store. "Email Address" would like to share the life celebration of Patricia "Pat" J. Swartz. Click on the "link" to go to share a favorite memory or leave a condolence message for the family.